September 25 1909 -- The Pittsburg(h) Pirates are going to the World Series to face off against the Detroit Tigers, an occasion that warrants a rare Herriman cartoon about the major leagues. The vast bulk of Herriman's baseball cartoons cover the Pacific Coast teams. Here's another card from that Gibson line published by Detroit Publishing, this one being #14006. Odd thing about this card is that the reverse is completely blank. I have several like this. Maybe these postcards were also sold as notecards? This famous Gibson cartoon with its unusual perspective has always reminded me of Andrew Wyeth's famous painting, Christina's World. It is unusual that the card is blank on one side. Ordinarily my guess would be that it might be a Mutoscope card, one that could be used as a post card if you chose, but Detroit Publishing seems to be too classy for that. I know that this is a post card, the "14,006" is fitting with the Gibson series cards. You may have a rare misprint, or perhaps, half-print. 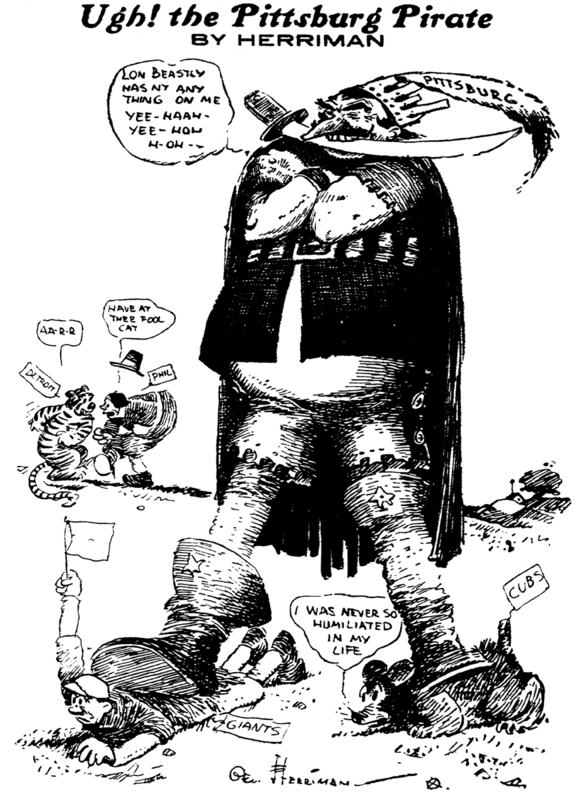 Incidentally, this cartoon was the centerspread of LIFE's 1 October 1896 ish. Just a question. Where do you guys draw the line between cartoon and illustration? This would be a ill in my book. I think there's a pretty vast gray area. Is Hal Foster's Prince Valiant cartooning or illustration? What about McCay's editorial cartoons? In fact, is anything not going for a laugh automatically illustration? The answer, to my thinking, lies in that illustrations are meant to provide graphic definition to what are primarily written works, whereas cartoons rely on the graphic, and the words are important but secondary. Therefore the McCay example is definitely illustration, whereas Foster is very much straddling two worlds. The illustration and prose are almost 50/50 collaborators in his case. As to the Gibson card? I think it is a cartoon. All that being said, I can very easily see counter-arguments. Lillian Currier Steinert was born on July 26, 1878, in Manhattan, New York City, according to Find a Grave. Her full name was published in History of the Mohawk Valley, Gateway to the West, 1614–1925: Covering the Six Counties of Schenectady, Schoharie, Montgomery, Fulton, Herkimer, and Oneida, Volume 4 (1925). Her parents were Howard Gray Steiner and Fannie Beers. Steinert has not yet been found in the 1880 U.S. Federal Census. The 1900 census recorded the family trio in Manhattan at 1966 Seventh Avenue. Steinert’s father was a customs inspector. Information about Steinert’s art training has not been found. Steinert was a contributor to the International Syndicate’s illustrated humor page. Her illustrations appeared in the Louisville Courier-Journal (Kentucky), on October 12, 1902. It’s likely her drawings appeared in other publications. Steinert may have been a public school teacher. A “Lillian Steinert” was listed in the Estimates of the Departments: Board of Education, Judiciary and Officers of the City of New York for the Year 1906. According to the 1910 census the family of three were Manhattan residents at 617–619 West 144 Street. Steinert and her husband were self-employed artists. At some point they moved upstate. The 1915 New York State census listed Steinert and her family in her father’s household on Piermont Avenue in Orangetown, Rockland County, New York. The quintet were in Manhattan at 633 West 148 Street in the 1920 census. Steinert was no longer working. Her husband was a poster artist with the United Cigar Company. Steinert’s mother was the head of the household in the 1925 New York state census. The family of four resided in Fort Plain, Montgomery County at 5 West Street. Steinert’s husband was an author and newspaperman. Steinert has not yet been found in the 1930 census. Steinert contributed to her husband’s publication, 34 Poems: 21 Poems with Fort Plain and Mohawk Valley Themes. The publishing date in not known. The 1940 census said Steinert and her husband, a newspaper editor, lived at the same address recorded in the 1925 state census. Their house was valued at six-thousand dollars. The census said Steinert completed four years of high school education and did not attend college. Steinert passed away December 8, 1945, in Fort Plain, New York, according to the New York Death Index at Ancestry.com. She was laid to rest at the Fort Plain Cemetery. Steinert’s husband passed away November 11, 1955 in Fort Plain. Greene knew the author Stephen Crane and they shared a studio with others. 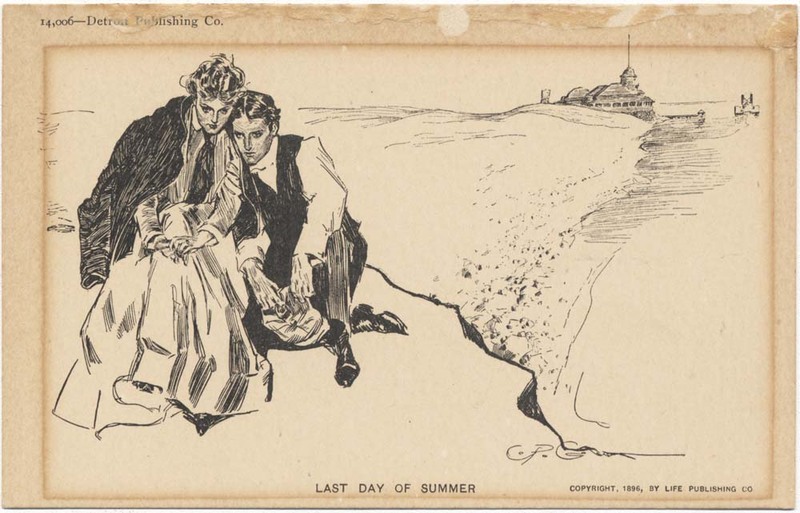 Greene’s illustrations appeared in many publications including Collier’s Weekly, Puck, and New York Tribune. Maybe Steinert lent a hand in some of Greene’s work. Greene was mentioned in The Sun and the New York Herald. As a historian he wrote about Mohawk Valley. The New York Times, May 5, 1963, reported the Fort Plain restoration and said the dedication of the Nelson Greene Memorial house occurred almost two years earlier. Charles E Bell was born in August 1873, in Williamsport, Pennsylvania. The birth date is from the 1900 U.S. Federal Census, however his age in later censuses suggest a birth in 1874. The New York Times, June 12, 1935, said Bell was born in Williamsport. In the 1880 census, Bell was the third of five children born to C. E. [Charles Edward], a contractor, and Fanny C. The family lived in Williamsport at 106 Upper Vim St. The 1900 census recorded the Bell family of eight in Williamsport at 523 5th Avenue. Twenty-six-year-old Bell was working as an artist. Pennsylvania marriage records, at Ancestry.com, recorded the union of Bell and Isabelle T. Foley on July 23, 1900 in Philadelphia. American Newspaper Comics (2012) said Bell produced three series for the Inquirer. Happy Bridget ran from August 18 to October 6, 1901 with assistance by Clare Dwiggins on September 15. 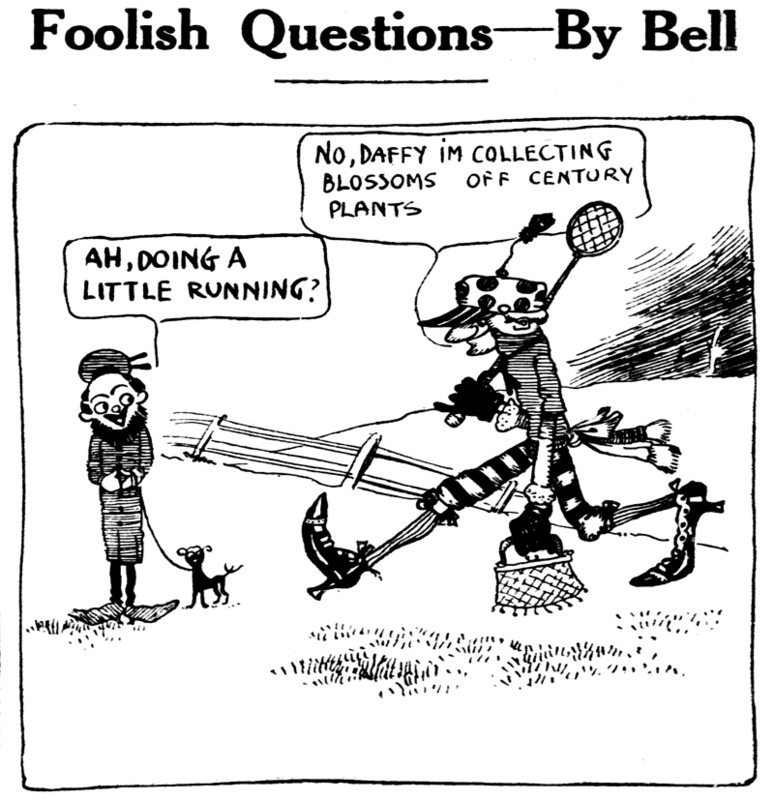 Foolish Questions appeared in the spring of 1909. Third was Isn’t This the Funny World?, running from January 28, 1912 into 1913. Bell contributed a drawing to Bohemia: Official Publication of the International League of Press Clubs for the Building and Endowment of the Journalists’ Home (1904). According to the 1910 census, Bell resided in Philadelphia at 5922 Cedar Avenue. He was a newspaper art director. His daughter, Kathryn, was six years old. Bell’s address and occupation were the same in the 1920 census. Newspaper cartoonist Bell and his family lived in Cheltenham, Pennsylvania at 8225 Manor Road as recorded in the 1930 census. The Inquirer, May 10, 1935, reported the celebratory activities of “Philadelphia on Parade” at Convention Hall and Commercial Museum. At the Inquirer’s exhibit was Bell. 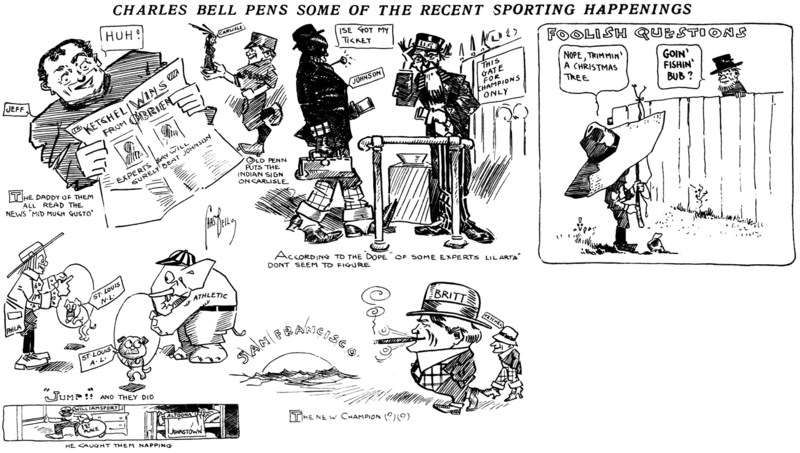 ...But what drew the crowds was the work of Charles E. Bell, Inquirer cartoonist, who in rapid succession sketched well-known figures. Hardly had he started when requests began to flow in. The cartoonist obligingly drew his conception of ball-players, movie actors and other favorites and presented the sketch to the one who had asked that it be made…. Bell passed away June 11, 1935, in Avalon, New Jersey. The Inquirer said Bell was at his summer home. The cause was heart disease. “Charlie” Bell, as he was known to innumerable intimates and to more than a generation of newspapermen and readers, was as much a historian of the first three decades of Philadelphia’s 20th century with the brush and pen as were his colleagues “on the news side” with their pencils and typewriters. 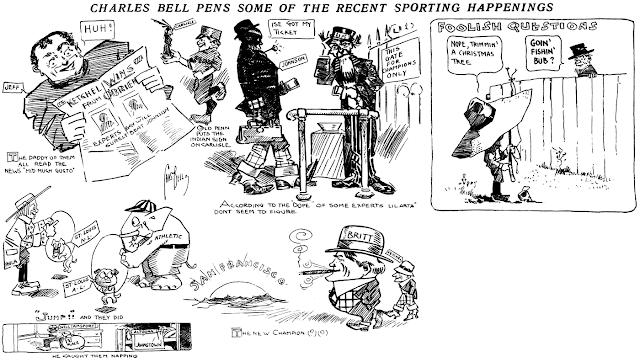 Charles Bell was a sports cartoonist for the Philadelphia Inquirer in the 1900s-30s, working in tandem at that paper with the sports cartoonist with the greatest pen name ever -- Jim Nasium. 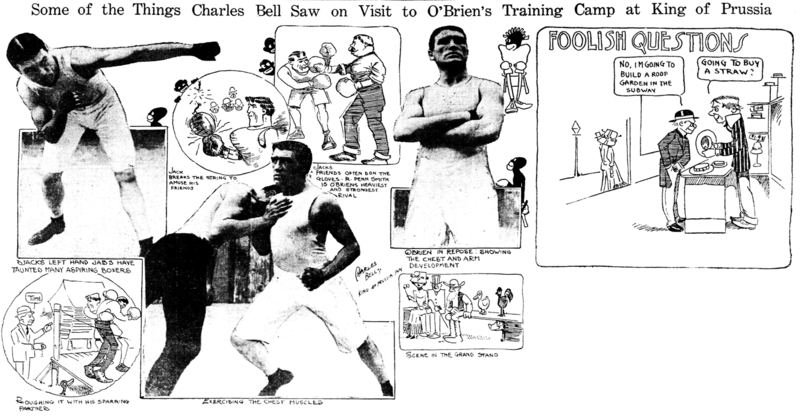 Nasium was the better cartoonist of the two, and maybe that had something to do with Bell trying to garner some attention by adding to his repertoire a panel cartoon titled Foolish Questions. 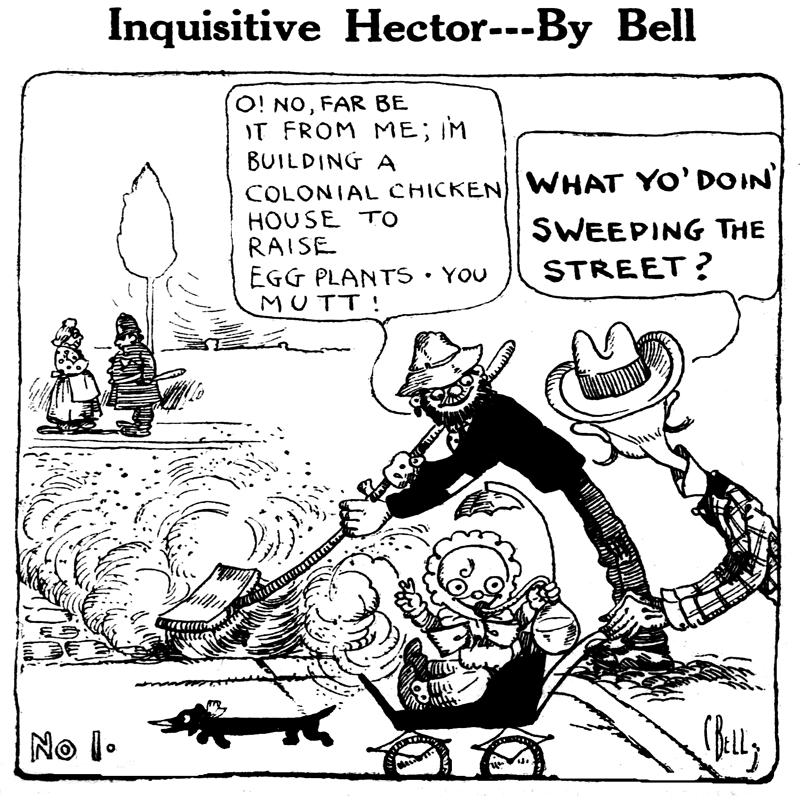 How Bell expected to shine up his reputation by making a bald-faced copy of Rube Goldberg's famed Foolish Questions is anyone's guess, but he did indeed do just that. The first panel of the series, run March 20 1909*, actually had a nod toward originality by creating a character who would ask the dumb questions. That first panel, titled Inquisitive Hector, was the beginning and ending of what might have been an entertaining twist on Goldberg's concept. Foolish Questions rarely ran more than once a week, sometimes appearing separately and sometimes as part of Bell's sports cartoon. In terms of pure humor, Bell did a pretty good job of copying the Goldberg brand of lunacy that made the panel so popular. This is more than some other copycats did, like Ray Ewer's rather bland Those Ridiculous Questions. However, Bell either didn't have the chops to offer the panels more often, or the Inquirer was less than interested in courting a lawsuit. Therefore, Foolish Questions last ran on June 14, having not run more than a dozen times in those three months. *Source: all dates from Philadelphia Inquirer. I notice that three of the four cartoons reprinted here have the answer on the left and the question on the right, as though the English language weren't written left to right. Was it not yet a standard practice that the dialogue in comics should generally be read left to right like everything else in English? Louis Goodman Ferstadt was born on October 7, 1900 in Berestechko, Russia, according to Who’s Who in American Jewry (1933). Ferstadt’s parents were Harry Wolf Berkowitz Ferstadt and Jennie Gahr. Ferstadt emigrated in 1910. A passenger list at Ancestry.com listed a Ferstadt family of five who arrived in Philadelphia on April 7, 1910. Tente and her four children had departed aboard the steamship Breslau from Bremen, Germany on March 24. The oldest child was Chane, an eleven-year-old female, followed by three males, Berel, ten; Mojsche, nine; and Leiser, one. Mojsche, I believe, was Louis Ferstadt. The passage was paid by Tente’s husband Chaskel Ferstadt who resided at 14 O’Brien Street in Chicago, Illinois. Who’s Who in American Jewry said Ferstadt studied at Chicago’s Hull House from 1916 to 1917. The Chicago Daily Tribune, June 27, 1918, published lists of graduates from several high schools. Ferstadt completed the Four Year General Course program at Medill. He continued his art training at the School of the Art Institute of Chicago from 1918 to 1923. 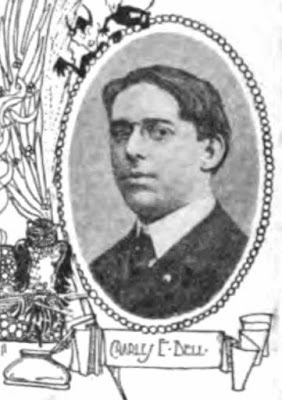 Ferstadt was on the Chicago Tribune art staff from 1918 to 1919. St. Nicholas, January 1918, included Ferstaft, for his drawing, on its Roll of Honor. In the 1920 U.S. Federal Census, Ferstadt, his parents, Harry and Jennie, and two older siblings, Dora and Ben, were Chicago residents at 1612 South Lawndale Avenue. His father was a dry goods salesman. Ferstadt was unemployed. Works by Ferstadt were included in The Book and Catalogue of the Second Retrospective Exhibition of the Art Institute Alumni Association (1922) and The Thirtieth Annual Exhibition of the Works of the Art Students League of Chicago (1923). Who’s Who in American Jewry said Ferstadt won a scholarship, in 1923, to the Art Students League in New York City. Who’s Who in American Art (1935) said Ferstadt was a pupil of Harry I. Stickroth (Art Institute of Chicago) and Kenneth Hayes Miller (Art Students League, New York). The 1925 New York state census recorded artist Ferstadt and his brother Benjamin, a bookbinder, in Brooklyn, New York at 91 Hicks Street. American Newspaper Comics (2012) aid Ferstadt drew The Kids in Our Block aka Our East Side Gang, beginning in 1926, for the New York Evening Graphic. Who’s Who in American Jewry said Ferstadt married Sophie Freedman on January 16, 1930 in Brooklyn. According to the 1930 census, Ferstadt lived alone at 178 Clinton Street in Brooklyn. He was a self-employed portrait painter. …There is another opening this week, that of paintings by Louis G. Ferstadt at the Studio Gallery in New York. Mr. Ferstadt is a talented young painter who is better known in New York than he is in Woodstock, where he lived and worked the past two or three summers. Ferstadt combines a modern technique with something of the emotional imagination. Ferstadt was listed in volume 29 of the American Art Annual (1932), “Ferstadt, Louis Goodman, Public Theatre Bldg., 66 Second Ave.. New York; h. 166 Ross”. The Pennsylvania Academy of the Fine Arts’s Catalogue of the Thirty-Second Annual Water Color Exhibition and the Thirty-Third Annual Exhibition of Miniatures, November 4–December 9, 1934, included a work by Ferstadt, “Students” (Lithograph, scratched on Solid Black). His address was 66 Second Avenue, New York City. Two pieces by Ferstadt were shown in the Whitney Museum of American Art’s Second Biennial Exhibition, Part Two: Watercolors and Pastels, February 18 to March 18, 1936. His address was 242 East 19th Street, New York City. Who’s Who in American Jewry said Ferstadt wrote scenarios for animated cartoons in 1935. 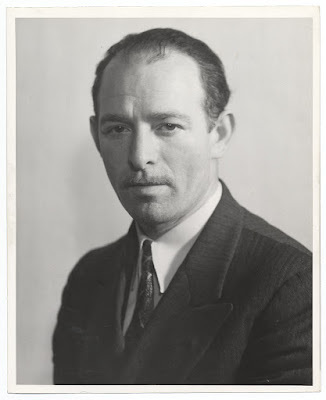 Who’s Who of American Comic Books 1928–1999 said Ferstadt worked at the Eisner and Iger studio from 1937 to 1939. Ferstadt formed his own studio and produced material for several comic book publishers. Ferstadt copyrighted Bob Kodar, The Hoppers, and Peter Gritt. Architecture critic Lewis Mumford mentioned Ferstadt in his review published in The New Yorker, April 17, 1937. Mumford’s review was reprinted in Sidewalk Critic: Lewis Mumford's Writings on New York (1998). …The most important innovation in wall decoration, however, was the design for a colored sign by Louis Ferstadt for the whole outside wall of a building. This is the first time, so far as I know, that a serious artist has attempted a wall decoration in electric lights, and though Ferstadt’s design was in the nature of a comic strip, I think this sort of thing need not be passed off with a Wrigley laugh. Is there any reason glass or pre-cast concrete tile should not be equipped with sockets so that entirely new effects could be worked out in colored lights, using smaller bulbs, placed more closely together? Ferstadt produced a subway mural for the 1939 New York World’s Fair. Ferstadt has not yet been found in the 1940 census. During the 1940s Manhattan city directories listed Ferstadt’s address as 2 West 45th Street. In 1953 his address was 510 West 124 Street and in 1959 it was 110 East 99th Street. Who’s Who in American Art, Volume 9 (1953) said Ferstadt was an art director at Fox Features Syndicate and affiliated with the Federal Art Project. The copyright for Ferstadt’s Sir Hokus Pokus and Junior was held by his wife, Sophie. The success of the book was reported in Publishers Weekly, March 8, 1947. Louis Ferstadt’s first book, “Sir Hokus Pokus and Junior” which he published late last fall, has now sold 60,000 copies. Mr. Ferstadt who did both the illustrations and text for “Sir Hokus Pokus and Junior” started his own firm, Louis Ferstadt Productions, in August 1946 (PW, August 31). Now that the first title has been launched, the firm plans to do a second printing of the same book, another story about “Sir Hokus Pokus” and other children’s books. Ferstadt passed away August 18, 1954 in Phoenicia, New York. The New York Times, August 20, 1954, said the cause was a heart attack at a summer camp. Ferstadt lived at 110 East 99th Street in Manhattan.